Bubble Bobble: Old & New is definitely old-school, but simple enough for new gamers to enjoy from the get-go. 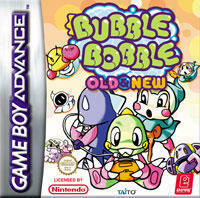 Bubble Bobble: Old & New is a nostalgia trip for most gamers, but will also quickly become a new favorite for newcomers. This port/upgrade begins with a nicely done introduction, featuring a combination of in-game clips and hand-drawn cartoons with a nice remix of the original game theme. The menus are very simplistic, but colorful. Select the version of the game you want, the level you want to start on, and go from there. You play as Bub (Bub and Bob if there's two of you playing via a Link Cable), who is turned into a dinosaur by the evil Wizard, who also happens to capture your girlfriend (or girlfriends). Given the power to shoot bubbles from your mouth, you venture on a journey to the Cave of Monsters on a quest to rescue your loved one. It's no Final Fantasy, but what can you expect from a game originally released in the 1980's? It's simple and cute, but it works. This game is a 2D game with simple sprites. The character sprites are vibrant, but don't stand out much more than any other sprites on the screen. The environment is made up of colored platforms and walls, with the color changing from level to level. The enemy designs are abundant, each unique in design. Again, simple makes perfect here. In the "new" version however, graphics are updated with new sprites and new backgrounds for the levels. Instead of a retro arcade look, this version looks more like a cartoon. More color and more textures, but often it makes the screen a little cluttered and hard to see. I still prefer the original version. One of my favorite parts of the game, sound is as clean and fun as it could be. From the noise of making a jump to the sound of shooting a bubble, they are on the dot with accuracy. For every little action, there is a unique sound effect. As for the soundtrack, there isn't much of one. You have one theme that plays constantly throughout the game (it doesn't change much, but it speeds up when you take too much time on one level) and one unique theme for the final boss. Not much for variety, but that one theme works well, and it'll be something you'll never forget. In the "new" version, it's the same way, except it uses the remixed main theme from the intro. It also has a few new sound effects, such as Bub making a sneezing noise when he dies. Upon pressing start, you are given an option of playing the original arcade version or a "new version." The mechanics of both games play the same. As a dinosaur, you can jump and shoot bubbles. Shooting bubbles at enemies will trap them for a period of time. From there, it's just a matter of jumping on or into the bubble-trapped enemies to send them flying. They come tumbling down and upon contact with the first platform they land on, they turn into an item you can collect, most notably food. Food ranges from fruit to burgers to ice cream sundaes to Popsicles. The food items are just to collect/eat, giving you points. Special items allow you to move faster, shoot bubbles farther, breathe fire, and even allow you to warp a few levels ahead. The flow of the game is quite simple. Kill all the enemies in the level while collecting items. Repeat for 99 levels before reaching the boss. While it seems like it would get repetitive, it doesn't. There are many unique enemies from little wind-up robots that just run around aimlessly, to UFOs that move from side to side and fire at you from above. Each level is unique in design as well, each requiring a different strategy to move around in. A save feature allows you start at the highest level you've reached. Put this all together and you have a frantic and fun game to pick up and play! As for the "new" version, it adds an item database, allowing you to keep track of what items you've collected throughout your quest. With 100 levels, two difficulty settings (one being unlocked only via a code), and two versions, this game will last for some great hours. While it can be beaten fairly quickly by the talented and persistent, it's fun enough to warrant multiple run throughs, especially with four different endings to unlock. Link up with a friend and enjoy two player action, which is a fun gaming experience as well as a social experience.